We are taking our property management services to the next level! As Shaeffer Hyde begins its 40th year, we are expanding to include a division focused solely on home care and preventative solutions. The Shaeffer Hyde Home Care division is inspired by our collective desire to protect the meticulously crafted homes of Vail Valley. In addition to new construction and luxury remodels, we have always been available for existing clients, as well as new, to perform seasonal maintenance and home care. Over the past several years there has been a spike in our post-construction endeavors. Our remodel team provides seasonal maintenance for a handful of clients, and we are experiencing increased demand for property management services. The new division will complement our existing team, and enhance their services. We are bringing in a highly accomplished and results-oriented Property Manager to head our new division, Shaeffer Hyde Home Care. With 12 years’ experience building and managing luxury homes, Scott Smith is joining the Shaeffer Hyde family. As Founder and General Manager of a luxury residential management firm which he sold in 2011, Scott comes to us with the tools to effectively drive the Home Care division. 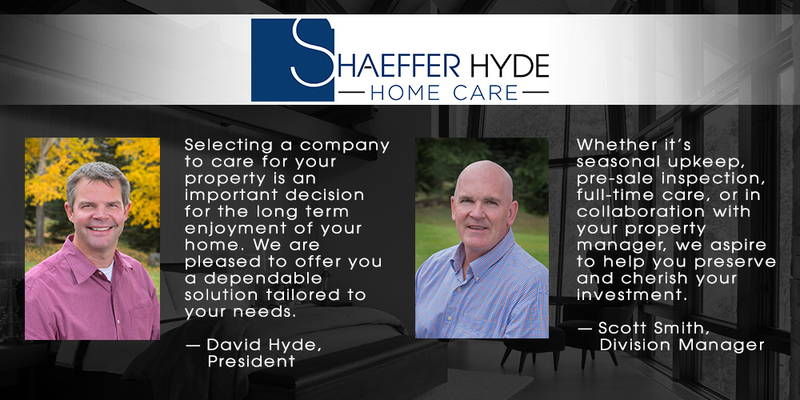 Shaeffer Hyde Home Care is currently offering custom assessments and tailoring property management services for both new and current clients.